Discussion in 'New Member Introductions' started by powerwagon896, Apr 14, 2019. Hi, I'm 67 years old and a retired skilled tradesman. My wife is a 4th grade teacher. The wife and I got our 1st Toyota, a Highlander, in 2016. After driving out the lease on the Highlander. 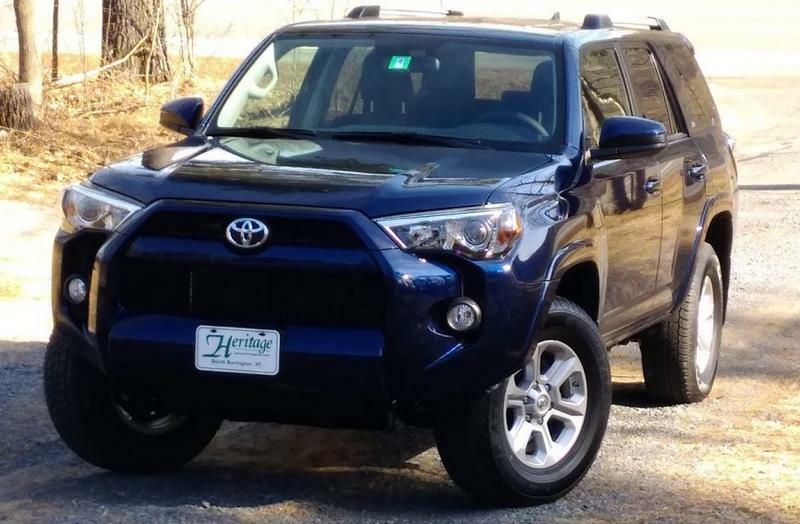 We decided it didn't quite suit our needs so we upgraded to a 4Runner. We just got the base model with 3rd row seats for the Grandchildren. I'll be adding roof rack crossbars and hope to find the 3rd row seat cargo mat that is only sold in Canada. Since we are in Northern NY state just 13 miles from the Cornwall, ON bridge, we might be able to score one of those at the Cornwall Toyota dealer. I'll also be getting some BFG All-Terrains on it for winter. We needed a light/medium duty tow vehicle for our 24' TT and wanted better off-road capabilities than what the Highlander offered. We also needed the roof rack for our 17' kayak/sailboat. Couldn't get that on the Highlander W/O buying a lot of bells and whistles we don't want or need. Hated the light gray interior too. 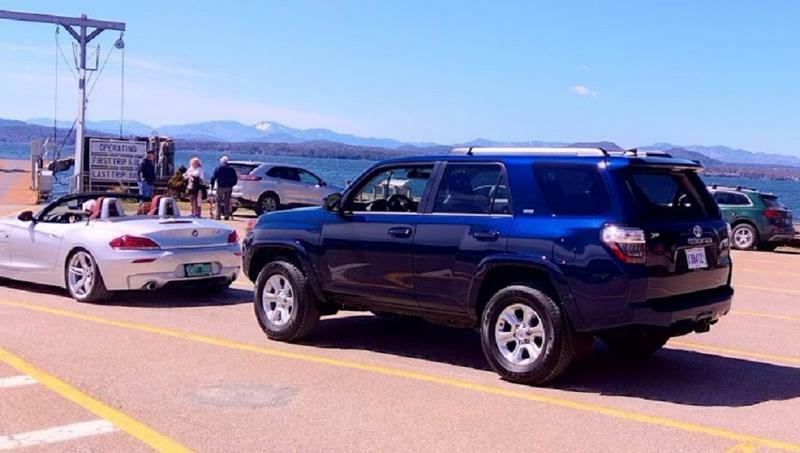 We couldn't find any colors we liked locally so we made the 3 hour trip to Burlington, VT. Heritage Toyota was great, best experience we ever had acquiring a new vehicle. They even gave us ferry tickets for a nice scenic ride home. 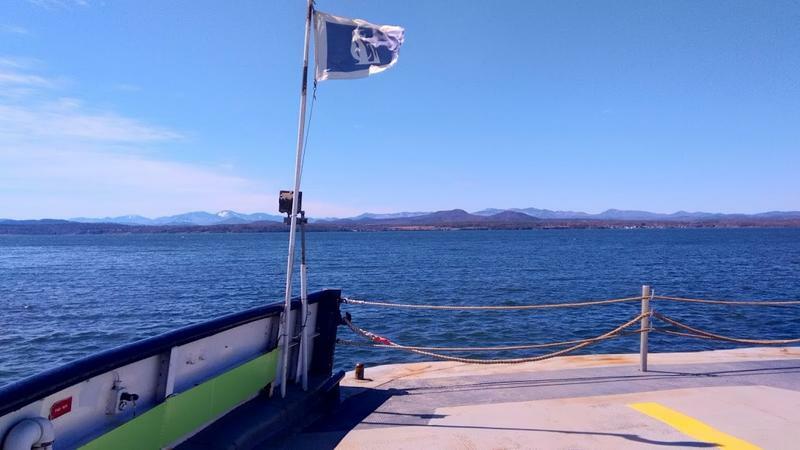 We had about a 120 mile drive through the Adirondack after we got off the ferry in Essex, NY. Very impressed with the way the 4.0 l V6 pulls the hills in it's easy laid back manner. Never got it much over the low 2000 rpm range during the trip through the high peaks region of the ADK. She ought to pull the 3800# TT with ease and seems like it might run for ever. When Wifey gets her next new car after this one is paid for, I'll be using that baby in the woods. WallyT4R, Thatbassguy, HoBoDanny and 1 other person like this. Welcome and nice choice in a retirement vehicle! Now, don’t listen to any of us cause we’re liable to spend your retirement income on goodies for it! Welcome! Sounds like you found the perfect vehicle. And it WILL run forever. Enjoy your retirement!